Later this month, a company called SpaceX is scheduled to launch its Falcon 9 rocket on a routine supply mission to the International Space Station (ISS). But if all goes as planned, this mission could herald the beginning of something decidedly not routine: the use of private, reusable rockets to service America’s space program. SpaceX and another private launch company, Orbital Sciences, are the beneficiaries of a recent shift in the American space program toward privatizing more routine missions – such as the transport of supplies and eventually people to and from the ISS. While this upcoming mission is only a preliminary test, SpaceX eventually hopes to dramatically reduce the cost of launching cargo and people into space by eventually making both the first and second stages of its rockets reusable. Last year, the company estimated that once its rockets are able to land back on earth and, after re-fueling, quickly be re-launched, the cost for a trip to the ISS could drop to as low as from $5 million to $7 million. These changes come at a time when Americans largely support continuing the nation’s efforts in space. A 2011 Pew Research Center poll found that nearly six-in-ten Americans say it is essential for the United States to continue to be a world leader in space exploration. 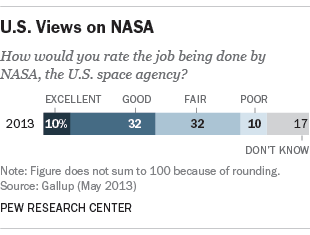 At the same time, recent Gallup polling finds that Americans today have less admiration for NASA, with fewer giving the agency “excellent” or “good” marks for its performance. The idea behind NASA’s new plan is that private contractors can do routine missions at a much lower cost, leaving the space agency more resources to focus on the next frontier in space travel, such as a human mission to Mars, or to an asteroid. Defenders of the plan, including President Obama, argue that the shift to bigger more ambitious missions is needed for the agency to regain the kind of pioneer spirit it displayed during the Apollo years in the 1960s and 1970s, when it successfully sent men to the moon. Others, including the first man to walk on the moon, the late Neil Armstrong, have criticized the new plan, arguing that companies like SpaceX are overpromising and will not be able to take people into space any time soon. Armstrong and others have said that outsourcing essential functions will leave NASA at the mercy of the Russian space program (which currently ferries astronauts to ISS) for years to come. NASA’s efforts at privatization have taken only a small part of its annual budget, which, this year totals $17.6 billion. So far, SpaceX and Orbital Sciences have been able to provide launch capabilities for a lot less than the space shuttle, but they also have less capacity than the shuttle in terms of payload. 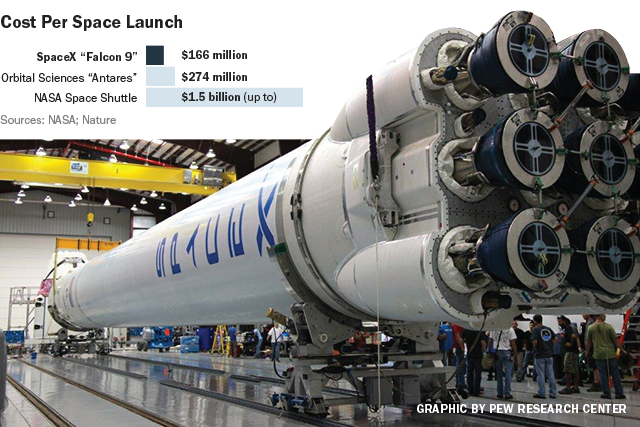 Factoring in NASA’s financial assistance in developing the Falcon 9 rocket and the cost of the 12-launch contract, the space agency is paying SpaceX about $166 million per launch to the ISS. By contrast, estimates for the cost of sending the recently retired space shuttle to the ISS range as high as $1.5 billion, including the money spent developing and building the shuttles. Note: This blog post has been updated. The planned April 14 launch was scrubbed due to a technical problem and has been rescheduled for later this month.